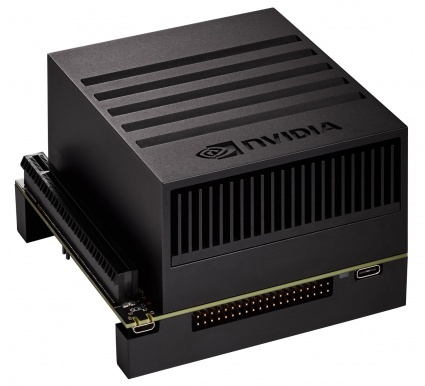 NVIDIA Jetson AGX Xavier is an embedded system-on-module (SoM) from the NVIDIA AGX Systems family, including an integrated Volta GPU with Tensor Cores, dual Deep Learning Accelerators (DLAs), octal-core NVIDIA Carmel ARMv8.2 CPU, 16GB 256-bit LPDDR4x with 137GB/s of memory bandwidth, and 650Gbps of high-speed I/O including PCIe Gen 4 and 16 camera lanes of MIPI CSI-2. Useful for deploying computer vision and deep learning to the edge, Jetson AGX Xavier runs Linux and provides 32 TeraOPS of compute performance in user-configurable 10/15/30W power profiles. Jetson AGX Xavier is currently available as the Jetson AGX Xavier Developer Kit and the production Jetson AGX Xavier standalone compute module. See the wiki of previous Jetson's here. 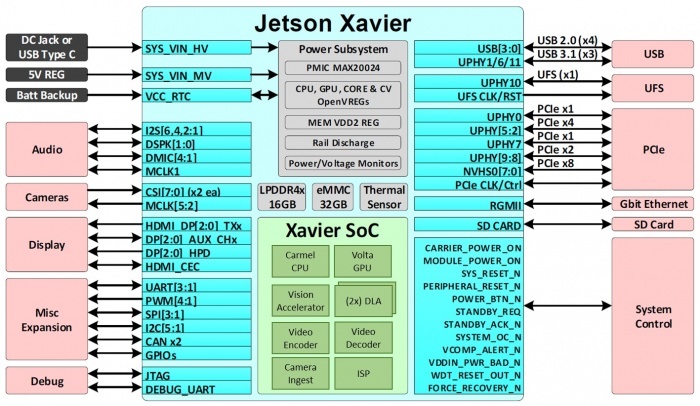 The Jetson AGX Xavier compute module contains all the active processing components. The I/O ports are broken out through a carrier board via a 699-pin board-to-board connector. Below is a partial list of the module's features. 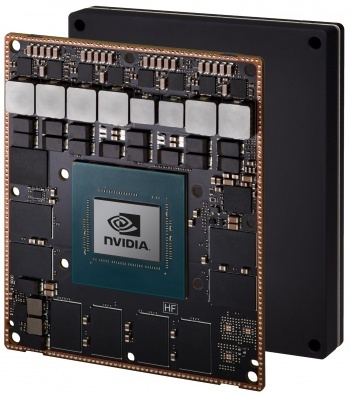 Please see the Jetson AGX Xavier Module Datasheet for the complete specifications. The Jetson AGX Xavier Developer Kit bundles together all the pre-assembled parts for developers to get started creating applications with Jetson AGX Xavier. The design files for the reference carrier board are freely available for download. Get the latest development software for PC and Jetson AGX Xavier by using JetPack. Visit NVIDIA's Embedded Computing developer portal and the Jetson AGX Xavier Developer Forum to access the latest documentation & downloads. The devkit is available worldwide through NVIDIA's Jetson AGX Xavier Developer Kit webpage. Alternatively, use the Region Selector to find distributors of the devkit in your region. 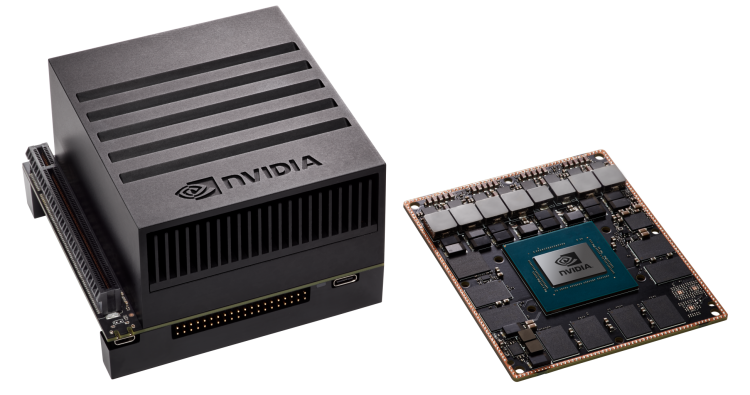 NVIDIA has released comprehensive documentation and reference designs for Jetson AGX Xavier, available through the Jetson Downloads Center. Module Datasheet the official module features, ports, signal pin-out, and package specifications. Design Guide detailed technical design and layout information for creating OEM products. Thermal Design Guide mechanical specifications for designing active and passive cooling solutions. DevKit User Guide user manual for setting up, configuring, and using the devkit. DevKit Carrier Spec design info about the reference carrier board from the devkit. DevKit Design Files schematics, layout, and design files for the devkit reference carrier board. L4T Documentation documentation for L4T kernel and userspace tools. Above is a partial list of documents. Please visit the Jetson Downloads Center for the full list that's currently available. This section contains recipes for following along on Jetson AGX Xavier. The following are 3rd-party accessories, cameras and carriers available for Jetson AGX Xavier. Please see the Supported Components List and Jetson Ecosystem directory for a full listing of product partners. Sensoray 1012 8 channel mPCIe analogue video capture card. Note that many CSI cameras from the TX1/TX2 era may be compatible with Jetson AGX Xavier, those that are listed above have been confirmed to work by the community as of this time. If you have a technical question or bug report, please visit the DevTalk Developer Forums and search or start a topic. For NVIDIA webstore Customer Service, please see the My Account page or contact 1-800-797-6530. This page was last edited on 16 April 2019, at 08:58.